The existing literature suggests that the relationship between RLS and migraine can be at multiple levels: Firstly, they may cooccur just by chance, as they both are prevalent; secondly, underlying biological factors, e.g. dopamine, melatonin, genes or cortical excitability, may increase the chances of their cooccurrence; ,,, thirdly, RLS causes sleep disturbance, which, in turn, can precipitate an episode of migraine;  and lastly, RLS is associated with depression and it can precipitate or worsen the primary headache. However, these studies had recruited patients from a headache clinic and then looked for the RLS in these subjects. Thus, a sampling bias could not be excluded during interpretation of results as some of the studies failed to find any difference on sleep parameters. However, recruitment of RLS patients from the sleep clinic would eliminate the effect of sleep disturbance on migraine and other headache as sleep disturbance would be seen in all cases. We hypothesized that RLS patients with migraine would be having (i) increased frequency and duration of RLS symptoms, (ii) higher chances of sleep disturbance caused by RLS, (iii) increased prevalence of depression and (iv) a positive family history of RLS as compared with the nonheadache group. The first three factors here examine the role of RLS on development of headache at the physiological level, while the last factor examines the role of genetic causation. This cohort study was conducted in the sleep clinic of a tertiary care teaching institution after taking informed consent from the patients during June 2011 to October 2011. Approval from the institutional ethics committee was sought beforehand. Sample size was calculated using Epi-info considering the prevalence of RLS as 50% in migraineurs for a study power of 95%. A total of 99 subjects presenting with complaints of idiopathic RLS according to the American Academy of Sleep Medicine (AASM) criteria were included in this study. The criteria describe an urge to move legs that commonly starts or worsens in the night; the urge is relieved by moving the legs, and increases on rest. All cases of RLS mimics were excluded. Physician's diagnosis of RLS was made by a person trained in sleep medicine (RG). Subjects with secondary headaches were not included in this study. Other exclusion criteria were presence of major neurological deficit, consumption of substances of abuse, cases of substance withdrawal, patients taking antipsychotics and overuse of opiate analgesics as defined by ICHD-2. Subjects who were not willing to participate in this study were also excluded, as also pregnant females and children. After explaining the purpose of the study, the demographic data of the patients was recorded. Subjects were then asked in detail about their sleep complaints. The history of RLS was taken, with particular emphasis on duration of symptoms, time since worsening of symptoms, average duration when the subjects were experiencing symptoms since aggravation, estimated frequency of RLS symptoms in a month since worsening of symptoms and family history of RLS. The minimal period for having RLS was not defined; however, all of them had frequent symptoms of RLS that were detrimental to their sleep. This was one reason why they attended the sleep clinic. None of them was taking drugs for the RLS at the time of enrolment in this study. Patients were asked if they suffered from any kind of headache during the past year. The diagnosis of headache was made according to ICHD-2 criteria by a neurologist (DG). If any subject had more than one type of headache, the headache that was more disturbing to him was considered as "principal headache," and another primary headache became the "co-morbid headache." The prophylactic drugs that these patients were taking, if any, for headache were also recorded. DSM-IV-TR criteria were used for the diagnosis of depressive disorders by a psychiatrist (VL). Because subjects with RLS often suffer from insomnia, and because chronic insomnia may mimic depression, the differentiation was carefully made. Two important features - sadness of mood and loss of interest in previously pleasurable activities - were considered for differentiating between depression and chronic insomnia. In addition, subjects were asked whether they felt better during the day after a night without RLS symptoms. Then sleep history was gathered by the sleep specialist (RG). They were categorically questioned on whether they experience "difficulty falling asleep" or "staying asleep" or both or none of them? The relationship between RLS symptoms and sleep problems was also examined, especially in those cases who complained of depression or nighttime onset of headache. Severity of insomnia was measured with the help of the insomnia severity index - Hindi version - and RLS severity was assessed with IRLS Hindi version. , Both these instruments have already been validated in the Hindi-speaking Indian population. A thorough clinical examination was performed. Statistical analysis was done with the help of SPSS v 17.0 for Windows. For the sake of statistical analysis, considering the "principal headache," the sample was divided into three major groups: RLS with migraine, RLS with other headache and, lastly, RLS without headache. Chi-square test and one-way analysis of variance were applied on these groups. The patient population aged between 12 and 70 years (mean age 39.91 years). The female to male ratio was 2:1 (67.7% females versus 32.3% males). Headache was seen in 51.5% cases of RLS during the past 1 year, and its diagnostic categorization is shown in [Figure 1]. Migraine was the most common type of "principal headache," reported by 44.4% subjects, and other types of "principal headaches" were reported by 7.1% subjects. 9.1% subjects had "co-morbid headache." This group included migraine without aura (1%), chronic migraine without aura (2%), migraine with aura (1%), chronic tension-type headache (4%) and probable medication overuse headache (1%). Females outnumbered males in the migraine subgroup (88.6% in migraine, 57.1% other headaches, 48.9% no headache; χ2 =16.46, P<0.001). Family history of RLS was not different among the groups (χ2 =2.65, P=0.26). 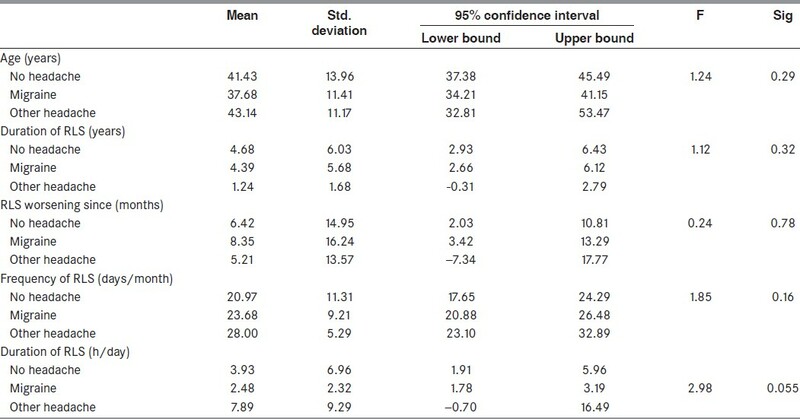 Subjectively perceived sleep interruption due to RLS was similar among the three groups (χ2 =5.63, P=0.06). Similarly, the prevalence of major depressive disorder was also not different among the groups (χ2 =3.12, P=0.21). Severity of RLS was not different between the headache and the no-headache groups (χ2 =5.27, P=0.22). Scores on the insomnia severity index were also comparable among the groups (F=0.60, P=0.43). Eighteen percent of the subjects among "RLS with headache" were taking prophylactic drugs for headache at the time of inclusion in the study. [Table 1] shows the comparison of average age, total duration of RLS, time since the RLS symptoms had aggravated, average time the subjects experienced RLS symptoms each day and frequency of RLS symptoms each month among the three groups. This study showed that migraine is frequently co-morbid with RLS. However, we did not find any effect of potential factors like sleep disturbance, severity of RLS, family history and depression. Earlier studies conducted in headache patients reported that RLS is more frequent in migraineurs as compared with population prevalence. Similarly, in the present study, the prevalence of migraine, and particularly migraine without aura, was higher in RLS patients as compared with the general population. This result could be a spurious finding as in previous studies as well as in the present study, as the samples were taken from the clinic. Earlier studies have shown that prevalence of headache is definitely higher in the clinical sample as compared with a population-based sample. ,, Hence, a population-based study assessing migraine and RLS will throw more light on this issue. Earlier studies had suggested that migraine and RLS might have a common neurobiological factor. Migraineurs with dopaminergic premonitory symptoms, e.g. yawning, somnolence, food craving, etc., were found to have higher chances of harboring RLS. d'Onafrio et al. also supported the dopaminergic hypothesis as an underlying factor. Dopamine deficiency has been implicated in the pathogenesis of RLS, and dopamine agonists have been found to be effective in the treatment of RLS. , On the other hand, migraineurs were thought to have an increased activation of dopaminergic neurotransmission, and dopamine antagonists were found to be an effective antimigraine therapy. These views are actually antagonistic and refute the dopaminergic link between the two disorders in question. However, recent literature suggests that the role of dopamine is not as straight-forward as always thought in migraine. Direct application of dopamine had been found to block firing of the trigemino-vascular system and to show antinociceptive effect. , Further, the sites implicated in the dopamine hypothesis of both disorders are dissimilar - nigro-striatal tract in RLS while ventral tegmental area and hypothalamus in migraine. , In short, multiple dopaminergic receptors in the brain at different levels and in different areas of the brain were implicated in RLS and migraine. Hence, further studies at the molecular level are required before we confirm a direct dopaminergic link between migraine and RLS. Secondly, if not the dopamine, then sleep disturbance might be another causative link between RLS and migraine. Sleep disturbance is inherent to RLS, and depends upon the severity, duration and frequency of symptoms. Migraine was also known to be associated with sleep disturbance. In addition, recent studies had shown that sleep disturbances lead to chronification of headache, and chronic headache patients often show co-morbid sleep disorders. , Earlier studies in migraine-RLS plus subjects had reported a higher prevalence of sleep disturbances in these subjects. , On the other hand, at least one other study conducted in migraineurs did not find any difference in the sleep quality between migraine-RLS plus and migraine without RLS subjects. We think that the difference could be attributed to sample selection. Earlier studies included patients from headache clinics; thus, they reduced the chances of finding disturbance in sleep, except in cases of frequent or chronic headache. On the contrary, we recruited subjects primarily presenting with sleep disturbance and hence, all of them had difficulties with sleep initiation or maintenance; hence, the effect of sleep disturbance was minimized on the causation of headache. Also, this could be one reason why we did not find a significant difference in sleep disturbance between "RLS with migraine" and "RLS without migraine" groups. Lastly, we hypothesized that a positive family history of RLS would be associated with increased chances of having migraine, as reported in a previous study. However, we failed to find any difference in the family history of RLS in subjects with and without migraine. This finding needs to be replicated as we cannot exclude the potential recall bias despite our best efforts to establish a family history of RLS. Or, it is also possible that there is no genetic or biological link between RLS and migraine. As already discussed earlier, a well-planned population-based study will be able throw more light on this issue. Like any other scientific study, the present study also had some methodological limitations: First, the sample was taken from a clinic and was not population based. Secondly, RLS, migraine, sleep disturbance and depression, are all functional disorders. Hence, we did not have any laboratory evidence of the problem. Thirdly, we could not reliably gather the data regarding total duration of headache, time since worsening, etc. as most of the subjects reported onset of headache during adolescence, and they were not able to provide the exact details regarding temporal change in symptoms of headaches, which could help us in categorization of the headache. Fourth, a recall bias cannot be excluded, especially regarding the family history of RLS. Fifth, we could not reliably establish the family history of headache in these subjects; hence, this was not included in the analysis. Still, this is the first study to examine the relationship between headache and RLS in RLS subjects. Strict exclusion criteria assured inclusion of idiopathic RLS only. In conclusion, migraine is frequently associated with RLS in the clinical population. However, the potential underlying mechanisms in a population-based sample need to be explored for providing better care to these patients. The authors are thankful to the MAPI research trust and Dr. Charles Morin for providing them the consent to use IRLS Hindi version and Insomnia Severity Index Hindi version in this study, respectively. 1. Munakata J, Hazard E, Serrano D, Klingman D, Rupnow MF, Tierce J, et al. Economic burden of transformed migraine: Results from the American Migraine Prevalence and Prevention (AMPP) Study. Headache 2009;49:498-508. 2. Skaer TL, Sclar DA. Economic implications of sleep disorders. Pharmacoeconomics 2010;28:1015-23. 3. 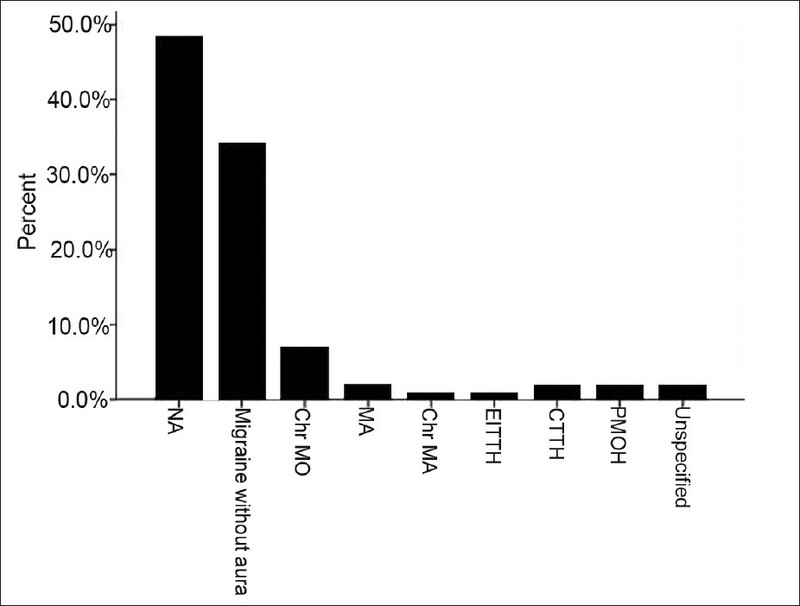 Cologno D, Cicarelli G, Petretta V, d'Onofrio F, Bussone G. High prevalence of Dopaminergic Premonitory Symptoms in migraine patients with Restless Legs Syndrome: A pathogenetic link? Neurol Sci 2008;29 Suppl 1: S166-8. 4. Sabayan B, Bagheri M, Borhani Haghighi A. Possible joint origin of restless leg syndrome and migraine. Med Hypotheses 2007;69:64-6. 5. d'Onofrio F, Bussone G, Cologno D, Petretta V, Buzzi MG, Tedeschi G, et al. Restless legs syndrome and primary headaches: A clinical study. Neurol Sci 2008;29 Suppl 1: S169-72. 6. d'Onofrio F, Cologno D, Petretta V, Finocchi C, Autunno M, Marsala G, et al. Restless legs syndrome is not associated with migraine with aura: A clinical study. Neurol Sci 2011;32 Suppl 1: S153-6. 7. Suzuki S, Suzuki K, Miyamoto M, Miyamoto T, Watanabe Y, Takashima R, et al. Evaluation of contributing factors to restless legs syndrome in migraine patients. J Neurol 2011; 258:2026-35. 8. Chen PK, Fuh JL, Chen SP, Wang SJ. Association between restless legs syndrome and migraine. J Neurol Neurosurg Psychiatry 2010;81:524-8. 9. Rhode AM, Hösing VG, Happe S, Biehl K, Young P, Evers S. Comorbidity of migraine and restless legs syndrome-a case-control study. Cephalalgia 2007;27:1255-60. 11. American Academy of Sleep Medicine. International classification of sleep disorders, 2 nd ed. Diagnostic and coding manual. Westchester: American Academy of Sleep Medicine; 2005. 13. Headache Classification Subcommittee of the International Headache Society. The International Classification of Headache Disorders. Cephalalgia 2004;24(Suppl 1):1-151. 14. American Psychiatric Association. Diagnostic and statistical manual of mental disorders 4 th ed., text rev. Washington, DC: American Psychiatric Association; 2000. 15. Lee HB, Hening WA, Allen RP, Kalaydjian AE, Earley CJ, Eaton WW, et al. Restless leg syndrome is associated with DSM-IV depressive disorder and Panic disorder in the community. J Neuropsychiatr Clin Neurosci 2008;20:101-5. 18. Senaratne R, Van Ameringen M, Mancini C, Patterson B, Bennett M. The prevalence of migraine headaches in an anxiety disorders clinic sample. CNS Neurosci Ther 2010;16:76-82. 19. Dilsaver SC, Benazzi F, Oedegaard KJ, Fasmer OB, Akiskal KK, Akiskal HS. Migraine in affectively ill Mexican adolescents. World Psychiatry 2009;8:37-9. 20. Gupta R, Bhatia MS, Singh NP, Upreti R. Association of depression with headache. Journal of Pakistan Psychiatric Society 2007;4:88-91. 21. Connor JR, Wang XS, Allen RP, Beard JL, Wiesinger JA, Felt BT, et al. Altered dopaminergic profile in the putamen and substantia nigra in restless leg syndrome. Brain 2009;132:2403-12. 23. Fanciullacci M, Alessandri M, Del Rosso A. Dopamine involvement in the migraine attack. Funct Neurol 2000;15 Suppl 3:171-81. 24. Charbit AR, Akerman S, Goadsby PJ. Dopamine: What's new in migraine? Curr Opin Neurol 2010;23:275-81. 25. Akerman S, Goadsby PJ. Dopamine and migraine: Biology and clinical implications. Cephalalgia 2007;27:1308-14. 26. Earley CJ, Silber MH. Restless legs syndrome: Understanding its consequences and the need for better treatment. Sleep Med 2010;11:807-15. 27. Gupta R, Bhatia MS, Dahiya D, Sharma S, Sapra R, Semalti K, et al. Impact of primary headache on subjective sleep parameters among adolescents. Ann Indian Acad Neurol 2008;11:164-9. 28. Sancisi E, Cevoli S, Vignatelli L, Nicodemo M, Pierangeli G, Zanigni S, et al. Increased prevalence of sleep disorders in chronic headache: A case-control study. Headache 2010;50:1464-72. 29. Odegård SS, Sand T, Engstrøm M, Stovner LJ, Zwart JA, Hagen K. The long-term effect of insomnia on primary headaches: A prospective population-based cohort study (HUNT-2 and HUNT-3). Headache 2011;51:570-80. 30. Nestler EJ, Carlezon WA Jr. The mesolimbic dopamine reward circuit in depression. Biol Psychiatry 2006;59:1151-9. 2 Is iron-deficiency anemia associated with migraine? Is there a role for anxiety and depression? 4 Clinical presentation of restless legs syndrome: Does the gender matter? Yücel, M., Akgün, H., Öz, O., Demirkaya, S.
Gupta, R., Lahan, V., Goel, D.